We power prosperity together by harnessing the insights, ideas, and investments of our diverse community. We strive to be a convener, using our statewide networks to bring communities together to learn and create change. Join us at one of our upcoming events and check out our community calendar of grantee events happening around the state. The Women’s Foundation of Colorado (WFCO) is a unique statewide community foundation that is focused on strengthening our state through the power of women. To fortify Colorado’s prosperity for generations to come, WFCO and our partners build economic pathways for women and their families in all of our communities – from the Pikes Peak region to the Eastern Plains. 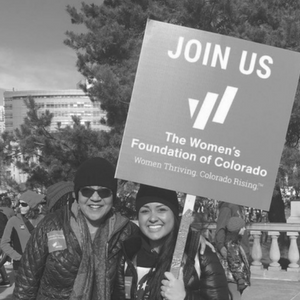 As a community foundation, The Women’s Foundation of Colorado focuses on systemic change, using generous donations and collaborative partnerships to fuel our work on public policy advocacy, research, and grantmaking. Although volunteer opportunities with The Foundation are limited, there are many ways to make a difference for Colorado women and their families. Would you like to schedule a lunch-and-learn with the staff of The Women’s Foundation of Colorado? Or are you seeking a keynote presentation on the economic advancement of women in Colorado? We can help you. Community helps guide our way forward. We believe that deliberately connecting with diverse communities to include multiple perspectives in our work leads to better results. We work with many partners to power prosperity. Five regional committees comprised of dedicated volunteers host up to 20 educational events every year so that women throughout Colorado can connect, learn to advocate, and drive change in their communities. Additionally, our president and CEO and other members of the WFCO staff frequently speak at events across many sectors. Recent speaking engagements include the Women’s March on Colorado, the American Association for Women in Community Colleges, and the South Metro Denver Chamber of Commerce.